Man has chased the dream of flight for as long as we can remember from Icarus to the first ski jumpers. Today skiers fly through the air twisting, flipping and grabbing like weightless acrobats. Nevertheless, as in everything skiing it all comes down to balance and stance. Balance and stance, balance and stance, the two most oft harped on skills by any ski instructor. Dynamic balance and a centered mobile stance make for better take-off pops 10-point landings, controlled rail slides and perpendicular balance in the half pipe. Good stance and balance entails keeping the hips over your feet and weight in the middle of the ski, with flexed, mobile ankles, knees, hips and back. Hands should be shoulder width apart and elbows bent at 90º; “hands up,” as many a coach has yelled. And as always, head should be up looking where you are going. Three points, not just good in basketball, refers to the balanced position from which the pop comes, and the flexed position of the landing. Both feet balanced evenly make up the first point. Each pole set firmly in the snow with your hands comfortably up and separated is another point. From this position, you are balanced and ready to take off for any trick. Landing on three points will minimize whiplash effects on your back and ensure a forward position so you land perpendicular to the slope. Start small. Hitting smaller kickers will build confidence and refine your skills. The ability to “pop” or use a dynamic extension at take-off is essential to do moves in the air. Start with stationary pops from your three-point stance. Extend fully to bring your skis off the ground, landing softly back in your three-point position. Practice bending your knees, ankles and hips to absorb the impact. Scope out a small, safe jump or roller; ski over it a few times, first absorbing the bump maintaining contact between the skis and snow the whole time. Once you know the jump and the landing, time the pop so that you extend from your three-points when your bindings are at the lip of the jump. Extend strong at the take-off, keeping your chin and hands up. Spot the landing. As soon as your skis leave the snow, look at your intended destination. This will help you prepare for the impact and get a sense of how much time you have to pull a trick. To prepare for the landing, lengthen your body in the air so that you have more space to absorb the impact. Eventually, when you try bigger more knarly tricks, you’ll want a compact body position in the air, but you will still want to lengthen for the landing. 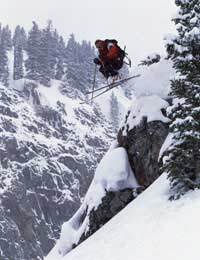 Timing and Coordination allow skiers to best utilize terrain features to take the most power and energy from each jump. Timing pops with the lip of a jump will provide the required explosiveness to do tricks. Read and react to the terrain, extending and absorbing over various features. Hit the jump over and over until you get bored, as the old adage goes, practice makes perfect. Next try tricks on the small jump, or stick to pure straight air on bigger jumps. Building up to the eventual misty flip off a wicked big table top. Hop Turns: Jump your skis from facing one side of the slope to the other. Keep your feet hip width apart and land on both feet at the same time. Emphasize getting the skis high off the snow, and staying in a ski-length corridor. See how many hop turns you can make in designated area. Ski Pole Jumping: Set someone else’s ski pole on a groomed slope. With minimal speed, practice jumping over it using your three-point take-off and landing. Remember to spot your landing. Repeat with increasing speed until you clear it every time, landing properly. Not everyone wants to go big, so start small and work your way up as you become comfortable. Many resorts offer kiddy or beginner parks with smaller tabletops, rails and half-pipes, or just steak-out your favorite slope-side kicker. Remember to use a spotter if you cannot see your landing, and obey terrain park safety rules.